Description: GO Big BLUE Go! East bound CP Rail train rolls thru West Salem with some nice "eastern" power! Description: former CR unit and older ac44 sit together waiting to be taken to cumberland for service. Description: You don't have a clue how much I think that rear unit should have been in front!!! 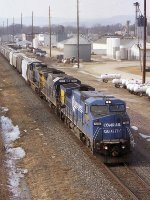 Description: csx 7388 ex CR 6266 leads Q302 into acca yard today.. Description: Note how the 7388 has its original number underneath. It appears the former number was 6265.